It is thus of interest to develop techniques to estimate such sums . Of course, the difficulty of this task depends on how “nice” the function is. The functions that come up in number theory lie on a broad spectrum of “niceness”, with some particularly nice functions being quite easy to sum, and some being insanely difficult. with sharper bounds available by using tools such as the Euler-Maclaurin formula (see this blog post). Exponentiating such asymptotics, incidentally, leads to one of the standard proofs of Stirling’s formula (as discussed in this blog post). This is a good estimate when is much smaller than , but as approaches in magnitude, the error term begins to overwhelm the main term , and one needs much more delicate information on the fractional part of in order to obtain good estimates at this point. where is periodic with some small period . By using techniques such as summation by parts, one can estimate such sums using the techniques used to estimate sums of periodic functions or functions with (Archimedean) smoothness. One also obtains similar types of representations for functions that are not quite multiplicative, but are closely related to multiplicative functions, such as the von Mangoldt function (whose Dirichlet series is not given by an Euler product, but instead by the logarithmic derivative of an Euler product). where each is periodic with period . in the sense of conditionally convergent series. Assuming one can justify this (which, ultimately, requires one to exclude zeroes of the Riemann zeta function on the line , as discussed in this previous post), one is eventually left with the estimate , which is useless as a lower bound (and recovers only the classical Chebyshev estimate as the upper bound). The inefficiency here when compared to the situation with the divisor function can be attributed to the signed nature of the Möbius function , which causes some cancellation in the divisor sum expansion that needs to be compensated for with improved estimates. This type of argument is also known as the Dirichlet hyperbola method. A variant of this argument can also deduce the prime number theorem from (3), (4) (and with some additional effort, one can even drop the use of (4)); this is discussed at this previous blog post. Similar arguments give asymptotics for on other quadratic polynomials; see for instance this paper of Hooley and these papers by McKee. Note that the irreducibility of the polynomial will be important. If one considers instead a sum involving a reducible polynomial, such as , then the analogous quantity becomes significantly larger, leading to a larger growth rate (of order rather than ) for the sum. the level here is initially of order , and the square root trick only lowers this to about , creating an error term that overwhelms the main term. And indeed, the asymptotic for such this sum has not yet been rigorously established (although if one heuristically drops error terms, one can arrive at a reasonable conjecture for this asymptotic), although some results are known if one averages over additional parameters (see e.g. this paper of Greaves, or this paper of Matthiesen). for any fixed , then the preceding methods would easily establish both results. Unfortunately, this bound can fail, as illustrated by the following example. Suppose that is the product of distinct primes , each of which is close to . Then has divisors, with of them close to for each . One can think of (the logarithms of) these divisors as being distributed according to what is essentially a Bernoulli distribution, thus a randomly selected divisor of has magnitude about , where is a random variable which has the same distribution as the number of heads in independently tossed fair coins. By the law of large numbers, should concentrate near when is large, which implies that the majority of the divisors of will be close to . Sending , one can show that the bound (8) fails whenever . for some depending only on . This nice elementary inequality (first observed by Landreau) already gives a quite short proof of van der Corput’s bound (7). for some absolute constant , is comparable to . In a similar spirit, one can show by similarly elementary means that the number of natural numbers less than that are -smooth, in the sense that all prime factors are at most , is only about or so. Because of this, one can hope that the bound (8), while not true in full generality, will still be true for most natural numbers , with some slightly weaker substitute available (such as (7)) for the exceptional numbers . This turns out to be the case by an elementary but careful argument. which turn out to be enough to obtain the right asymptotics for the number of solutions to the equation . Below the fold I will provide some more details of the arguments of Landreau and of Erdös. As with mini-polymath1 and mini-polymath2, I myself will be serving primarily as a moderator, and hope other participants will take the lead in the research and in keeping the wiki up-to-date. Just a reminder that the mini-polymath3 project begins in 24 hours, on July 19, 8pm UTC. Degree (cubic) curves , which include the elliptic curves (with non-zero discriminant , so that the curve is smooth) as examples (ignoring some technicalities when has characteristic two or three), but also include the reducible examples of the union of a line and a conic section, or the union of three lines. Algebraic affine plane curves can also be extended to the projective plane by homogenising the polynomial. For instance, the affine quadric curve would become . One of the fundamental theorems about algebraic plane curves is Bézout’s theorem, which asserts that if a degree curve and a degree curve have no common component, then they intersect in at most points (and if the underlying field is algebraically closed, one works projectively, and one counts intersections with multiplicity, they intersect in exactly points). Thus, for instance, two distinct lines intersect in at most one point; a line and a conic section intersect in at most two points; two distinct conic sections intersect in at most four points; a line and an elliptic curve intersect in at most three points; two distinct elliptic curves intersect in at most nine points; and so forth. Bézout’s theorem is discussed in this previous post. From linear algebra we also have the fundamental fact that one can build algebraic curves through various specified points. For instance, for any two points one can find a line passing through the points , because this imposes two linear constraints on three unknowns and is thus guaranteed to have at least one solution. Similarly, given any five points , one can find a quadric curve passing through these five points (though note that if three of these points are collinear, then this curve cannot be a conic thanks to Bézout’s theorem, and is thus necessarily reducible to the union of two lines); given any nine points , one can find a cubic curve going through these nine points; and so forth. This simple observation is one of the foundational building blocks of the polynomial method in combinatorial incidence geometry, discussed in these blog posts. In the degree case, it is always true that two distinct points determine exactly one line . In higher degree, the situation is a bit more complicated. For instance, five collinear points determine more than one quadric curve, as one can simply take the union of the line containing those five points, together with an arbitrary additional line. Similarly, eight points on a conic section plus one additional point determine more than one cubic curve, as one can take that conic section plus an arbitrary line going through the additional point. However, if one places some “general position” hypotheses on these points, then one can recover uniqueness. For instance, given five points, no three of which are collinear, there can be at most one quadric curve that passes through these points (because these five points cannot lie on the union of two lines, and by Bézout’s theorem they cannot simultaneously lie on two distinct conic sections). For cubic curves, the situation is more complicated still. Consider for instance two distinct cubic curves and that intersect in precisely nine points (note from Bézout’s theorem that this is an entirely typical situation). Then there is in fact an entire one-parameter family of cubic curves that pass through these points, namely the curves for any (with the convention that the constraint is interpreted as when ). 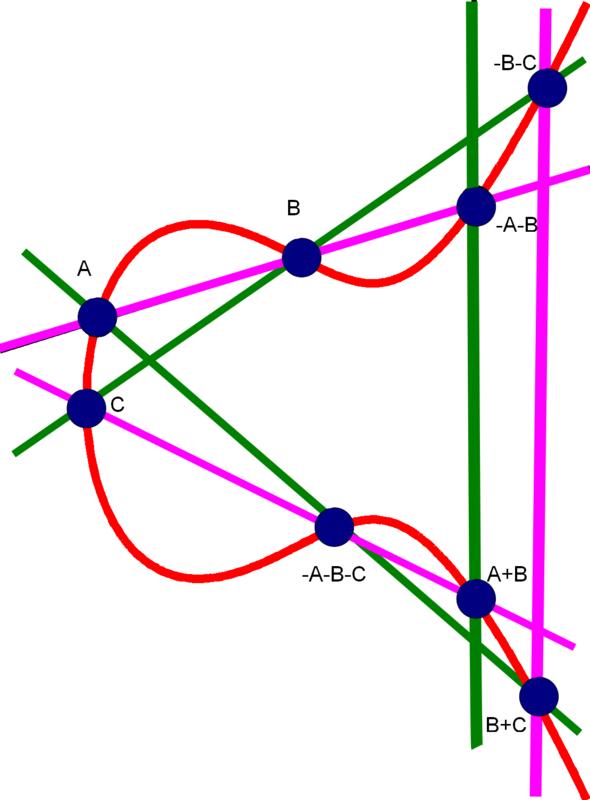 Proposition 1 (Cayley-Bacharach theorem) Let and be two cubic curves that intersect (over some algebraically closed field ) in precisely nine distinct points . Let be a cubic polynomial that vanishes on eight of these points (say ). Then is a linear combination of , and in particular vanishes on the ninth point . Proof: (This proof is based off of a text of Husemöller.) We assume for contradiction that there is a cubic polynomial that vanishes on , but is not a linear combination of and . We first make some observations on the points . 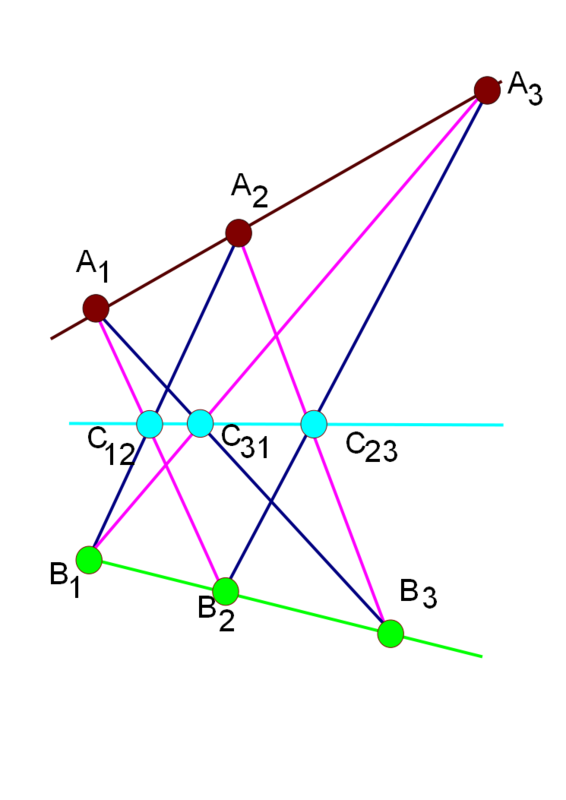 No four of these points can be collinear, because then by Bézout’s theorem, and would both have to vanish on this line, contradicting the fact that meet in at most nine points. For similar reasons, no seven of these points can lie on a quadric curve. One consequence of this is that any five of the determine a unique quadric curve . The existence of the curve follows from linear algebra as discussed previously. 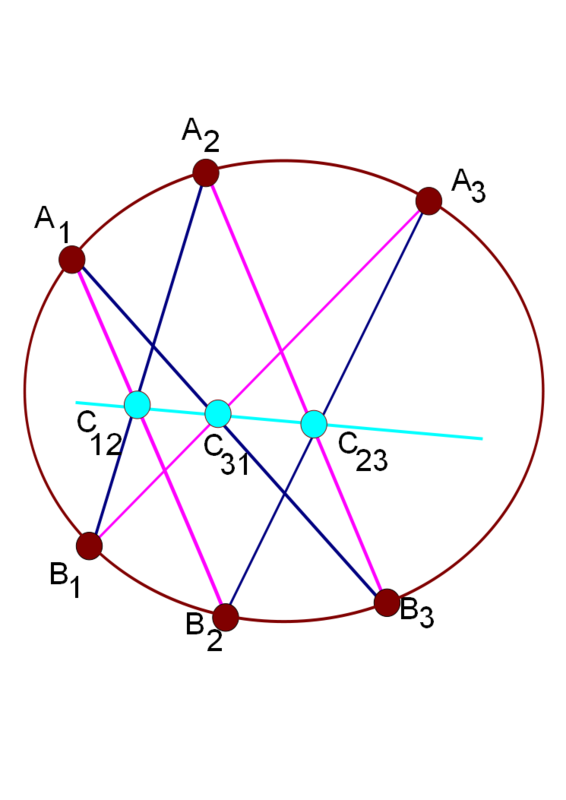 If five of the points lie on two different quadric curves , then by Bezout’s theorem, they must share a common line; but this line can contain at most three of the five points, and the other two points determine uniquely the other line that is the component of both and , and the claim follows. Now suppose that three of the first eight points, say , are collinear, lying on a line . The remaining five points do not lie on , and determine a unique quadric curve by the previous discussion. Let be another point on , and let be a point that does not lie on either or . By linear algebra, one can find a non-trivial linear combination of that vanishes at both and . Then is a cubic polynomial that vanishes on the four collinear points and thus vanishes on , thus the cubic curve defined by consists of and a quadric curve. This curve passes through and thus equals . But then does not lie on either or despite being a vanishing point of , a contradiction. Thus, no three points from are collinear. In a similar vein, suppose next that six of the first eight points, say , lie on a quadric curve ; as no three points are collinear, this quadric curve cannot be the union of two lines, and is thus a conic section. The remaining two points determine a unique line . Let be another point on , and let be another point that does not lie on either and . As before, we can find a non-trivial cubic that vanishes at both . As vanishes at seven points of a conic section , it must vanish on all of , and so the cubic curve defined by is the union of and a line that passes through and , which must necessarily be . But then this curve does not pass through , a contradiction. Thus no six points in lie on a quadric curve. Finally, let be the line through the two points , and the quadric curve through the five points ; as before, must be a conic section, and by the preceding paragraphs we see that does not lie on either or . We pick two more points lying on but not on . As before, we can find a non-trivial cubic that vanishes on ; it vanishes on four points on and thus defines a cubic curve that consists of and a quadric curve. The quadric curve passes through and is thus ; but then the curve does not pass through , a contradiction. This contradiction finishes the proof of the proposition. Theorem 2 (Pappus’ theorem) Let be two distinct lines, let be distinct points on that do not lie on , and let be distinct points on that do not lie on . Suppose that for , the lines and meet at a point . Then the points are collinear. Proof: We may assume that are distinct, since the claim is trivial otherwise. Let be the union of the three lines , , and (the purple lines in the first figure), let be the union of the three lines , , and (the dark blue lines), and let be the union of the three lines , , and (the other three lines). By construction, and are cubic curves with no common component that meet at the nine points . Also, is a cubic curve that passes through the first eight of these points, and thus also passes through the ninth point , by the Cayley-Bacharach theorem. The claim follows (note that cannot lie on or ). Theorem 3 (Pascal’s theorem) Let be distinct points on a conic section . Suppose that for , the lines and meet at a point . Then the points are collinear. One can view Pappus’s theorem as the degenerate case of Pascal’s theorem, when the conic section degenerates to the union of two lines. Theorem 4 (Associativity of the elliptic curve law) Let be a (projective) elliptic curve, where is the point at infinity on the -axis, and the discriminant is non-zero. Define an addition law on by defining to equal , where is the unique point on collinear with and (if are disjoint) or tangent to (if ), and is the reflection of through the -axis (thus are collinear), with the convention . Then gives the structure of an abelian group with identity and inverse . Let be the union of the three lines , , and (the purple lines), and let be the union of the three lines , , and (the green lines). Observe that and are cubic curves with no common component that meet at the nine distinct points . The cubic curve goes through the first eight of these points, and thus (by Proposition 1) also goes through the ninth point . This implies that the line through and meets in both and , and so these two points must be equal, and so as required. One can view Pappus’s theorem and Pascal’s theorem as a degeneration of the associativity of the elliptic curve law, when the elliptic curve degenerates to three lines (in the case of Pappus) or the union of one line and one conic section (in the case of Pascal’s theorem). I have just uploaded to the arXiv my paper “On the number of solutions to “, submitted to the Journal of the Australian Mathematical Society. for each prime . As the case is easily solved, we may of course restrict attention to odd primes. we see that the conjecture holds when . Further identities of this type can be used to resolve the conjecture unless is a quadratic residue mod , which leaves only six residue classes in that modulus to check (namely, , and ). However, there is a significant obstruction to eliminating the quadratic residue classes, as we will discuss later. By combining these reductions with extensive numerical calculations, the Erdös-Straus conjecture was verified for all by Swett. One approach to solving Diophantine equations such as (1) is to use methods of analytic number theory, such as the circle method, to obtain asymptotics (or at least lower bounds) for the number of solutions (or some proxy for this number); if one obtains a lower bound which is nontrivial for every , one has solved the problem. (One can alternatively view such methods as a variant of the probabilistic method; in this interpretation, one chooses the unknowns according to some suitable probability distribution and then tries to show that the probability of solving the equation is positive.) Such techniques can be effective for instance for certain instances of the Waring problem. However, as a general rule, these methods only work when there are a lot of solutions, and specifically when the number of solutions grows at a polynomial rate with the parameter . Readers familiar with analytic number theory will recognise the right-hand side from the divisor bound, which indeed plays a role in the proof. Since the number of primes less than is comparable to by the prime number theorem, this shows that the mean value of in this range is between and , and the mean value of is between and , which gives the previous result as a corollary (thanks to a Markov inequality argument). A naive Poisson process heuristic then suggests that each prime has a “probability” of having a solution to (1), which by the Borel-Cantelli lemma heuristically suggests that there are only finitely many for which (1) fails. Of course, this is far from a rigorous proof (though the result of Vaughan mentioned earlier, which is based on the large sieve, can be viewed as a partial formalisation of the argument). Lemma 2 Let be an odd prime. Then is equal to three times the number of triples of positive integers, with coprime, dividing , and dividing . Similarly, is equal to three times the number of triples of positive integers, with coprime, dividing , and dividing . in which one or two of the are divisible by , with the other denominators being coprime to . (Of course, one can still get representations of by starting with a representation of and dividing by , but such representations are is not of the above form.) This shows that any attempt to establish the Erdös-Straus conjecture by manually constructing as a function of must involve a technique which breaks down if is replaced by (for instance, this rules out any approach based on using polynomial combinations of and dividing into cases based on residue classes of in small moduli). Part of the problem here is that we do not have good bounds that prevent a prime from “spoofing” a perfect square to all small moduli (say, to all moduli less than a small power of ); this problem is closely related (via quadratic reciprocity) to Vinogradov’s conjecture on the least quadratic nonresidue, discussed in this previous blog post. It remains to control the sums for . The lower bounds are relatively routine to establish, arising from counting the contribution of those that are somewhat small (e.g. less than ), and use only standard asymptotics of arithmetic functions and the Bombieri-Vinogradov inequality (to handle the restriction of the summation to primes). To obtain (nearly) matching upper bounds, one needs to prevent from getting too large. In the case of , the fact that divides and divides soon leads one to the bounds , at which point one can count primes in residue classes modulo with reasonable efficiency via the Brun-Titchmarsh inequality. This inequality unfortunately introduces a factor of , which we were only able to handle by bounding it crudely by , leading to the double logarithmic loss in the sum. to obtain an upper bound of . Any improvement upon this bound would lead to a corresponding improvement in the upper bound for . While improvement is possible in some ranges (particularly when is large) using various bounds on Kloosterman-type exponential sums, I was not able to adequately control these sums when was fairly small (e.g. polylogarithmic size in ), as one could no longer extract much of an averaging effect from the summation in that case. Part of the difficulty is that in that case one must somehow exploit the fact that is irreducible as a polynomial in for any fixed , otherwise there will be too many divisors. Because of this fact, it would seem that quantitative bounds, such as polynomial type bounds that show that one quantity is controlled in a polynomial fashion by another quantity , are not easily obtainable through the ineffective methods of nonstandard analysis. Actually, this is not the case; as I will demonstrate by an example below, nonstandard analysis can certainly yield polynomial type bounds. The catch is that the exponent in such bounds will be ineffective; but nevertheless such bounds are still good enough for many applications. then there also exists a solution whose coefficients are algebraic numbers (i.e. they lie in the algebraic closure of the rationals). for all . This shows that there is no solution to over , as required. Remark 1 Observe that in the above argument, one could replace and by any other pair of fields, with the latter containing the algebraic closure of the former, and still obtain the same result. The above lemma asserts that if a system of rational equations is solvable at all, then it is solvable with some algebraic solution. But it gives no bound on the complexity of that solution in terms of the complexity of the original equation. Chang’s lemma provides such a bound. If is an integer, let us say that an algebraic number has height at most if its minimal polynomial (after clearing denominators) consists of integers of magnitude at most . then there also exists a solution whose coefficients are algebraic numbers of degree at most and height at most , where depends only on , and . Chang proves this lemma by essentially establishing a quantitative version of the nullstellensatz, via elementary elimination theory (somewhat similar, actually, to the approach I took to the nullstellensatz in my own blog post). She also notes that one could also establish the result through the machinery of Gröbner bases. In each of these arguments, it was not possible to use Lemma 1 (or the closely related nullstellensatz) as a black box; one actually had to unpack one of the proofs of that lemma or nullstellensatz to get the polynomial bound. However, using nonstandard analysis, it is possible to get such polynomial bounds (albeit with an ineffective value of the constant ) directly from Lemma 1 (or more precisely, the generalisation in Remark 1) without having to inspect the proof, and instead simply using it as a black box, thus providing a “soft” proof of Lemma 2 that is an alternative to the “hard” proofs mentioned above. Here’s how the proof works. Informally, the idea is that Lemma 2 should follow from Lemma 1 after replacing the field of rationals with “the field of rationals of polynomially bounded height”. Unfortunately, the latter object does not really make sense as a field in standard analysis; nevertheless, it is a perfectly sensible object in nonstandard analysis, and this allows the above informal argument to be made rigorous. but such that there does not exist any such solution whose coefficients are algebraic numbers of degree at most and height at most . of the (standard) polynomials is a nonstandard polynomial of degree at most , whose coefficients now lie in the nonstandard rationals . Actually, due to the height restriction, we can say more. Let be the ultralimit of the , this is a nonstandard natural number (which will almost certainly be unbounded, but we will not need to use this). Let us say that a nonstandard integer is of polynomial size if we have for some standard natural number , and say that a nonstandard rational number is of polynomial height if , are of polynomial size. Let be the collection of all nonstandard rationals of polynomial height. (In the language of nonstandard analysis, is an external set rather than an internal one, because it is not itself an ultraproduct of standard sets; but this will not be relevant for the argument that follows.) It is easy to see that is a field, basically because the sum or product of two integers of polynomial size, remains of polynomial size. By construction, it is clear that the coefficients of are nonstandard rationals of polynomial height, and thus are defined over . Remark 2 The same argument actually gives a slightly stronger version of Lemma 2, namely that the integer coefficients used to define the algebraic solution can be taken to be polynomials in the coefficients of , with degree and coefficients bounded by .